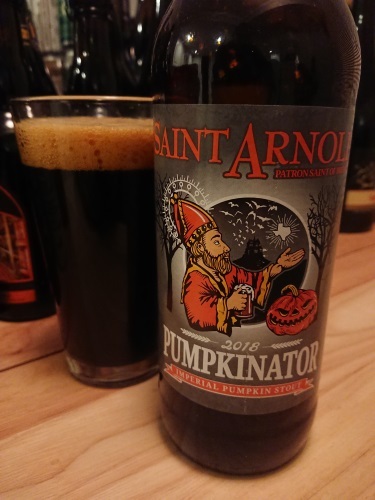 Pumpkinator is a big, black, full of spice, full of flavor beer. Originally released in 2009 as Divine Reserve No. 9, it is an imperial pumpkin stout and our answer to how a pumpkin beer ought to taste. It is brewed with a combination of pale two row, caramel and black malts, Cascade and Liberty hops for a background hop flavor, pumpkin for a rich mouthfeel, molasses, brown sugar, spices and dry-spiced to make it feel like you just walked into your mom’s kitchen while she was cooking 37 pumpkin pies. It is the most expensive beer we have brewed. A single batch of Pumpkinator will be released around every October 15. It is available in 22 oz. bottles and on draft. This beer is best enjoyed at 50°F or warmer to bring out the spices and round.